Lead is a soft poisonous metal that is used in colored paints and ceramic glazes. It is found notably in the glaze colors red, yellow, white, and orange. This lead glaze is often used on ceramic, clay, porcelain, stone, or earthen pottery or cookware. According to the US EPA (Environmental Protection Agency) and many scientific research, high exposure to this metal causes Lead Poisoning which can damage the human nervous system, cause blood and brain development disorders (especially in young children), hypertension, and damage to the heart, kidneys, bones, intestines, and reproductive systems. Extreme toxicity levels of lead can even be fatal. 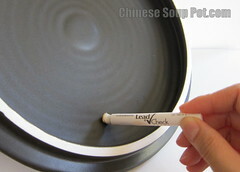 So how do you know if your pottery or ceramic cookware is free of lead? You can do a home lead paint test. It is very easy and there are many inexpensive products on the market that can detect lead levels as low as 1-2 micrograms. 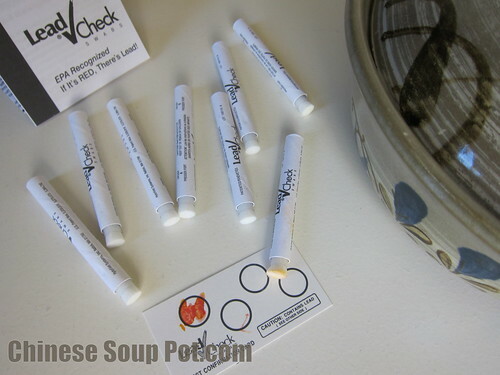 For a few dollars, these lead tests give you peace of mind in knowing that your ceramic clay pottery is safe. I bought a pack of eight lead testing swabs for about $3 each swab. This is a minuscule investment considering the immense health damage that lead can cause you and your family. Clean and removal all dust and dirt from the painted or glazed surface to be tested. Activate the test swab by crushing the two marked ends of the swab stick with your fingers. Shake a few times to mix the testing agents inside. Gently squeeze the swab so that the swab tip is moistened with the liquid testing agent. Rub the activated swab tip on the cleaned surface for 30 seconds. If the swab tip turns pink or red, that means lead is detected. If you want to test for lead in all layers of paint on your ceramic pot, find an unnoticeable spot (e.g., the underside of the lid). Use a clean knife or scraper and cut a small 1/4 inch notch at a diagonal to expose all painted layers down to the bare surface. Then rub the activated swab tip for 30 seconds to test for lead. Ultimately, you do not want to see red or pink on the swab after your test. 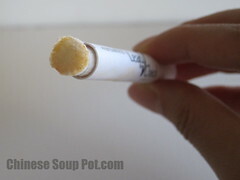 The test swab may turn a light yellowish orange (see photo to the right). But this is not a problem since the colored liquid testing agent will stain the swab. If your test result is negative, squeeze a small drop of the liquid testing agent onto a small lead dot (should be included in the kit) to make sure that the testing agent is activated and working properly. This extra step is to eliminate the chance of a false negative test result. Led testing kit can be found at hardware stores such as Lowes, Ace Hardware, Home Depot, or conveniently on this list at Amazon.com. I used a lead test kit made for testing *all surfaces*, and this is the particular lead test kit I used. 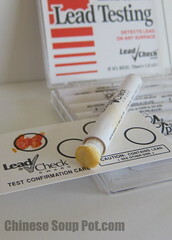 EPA is aware that when utilized by a certified renovator, the LeadCheck® lead test kit can dependably identify that specific lead-based paint isn’t existing on wood or ferrous metal.